Tip: Before cooking, discard any open clams that don't close with a light tap. Cook the linguine in a large saucepan of salted, boiling water until 'al dente, ' usually 8-10 minutes. In the meantime, heat a large saute pan over a medium heat until hot. Add the olive oil, and then the garlic, sautéing for about 20 seconds until golden. Add the clams, increase the heat, and cover with the white wine. Bring the wine to the boil and then cover the pan with a lid. Cook for about 3 minutes until the clams have opened, discarding any that haven't. Set the pan to one side. Drain the linguine when ready, reserving a cup of the cooking water. 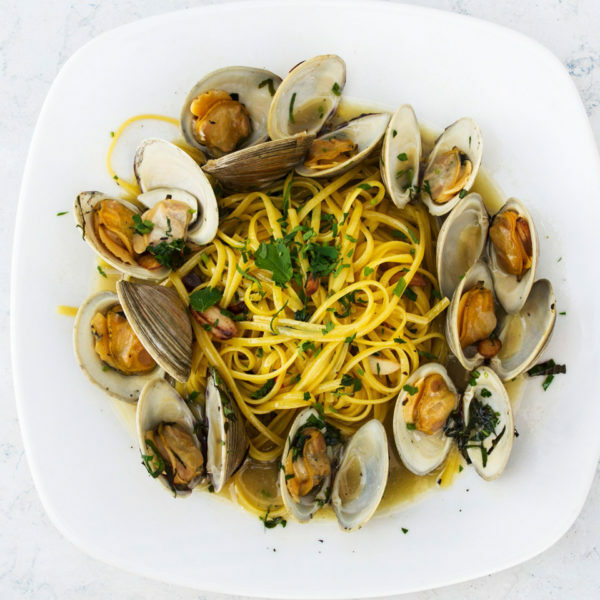 Add the linguine to the clams, stirring and tossing well. Continue to cook over a moderate heat until the linguine is glossy, adding some of the reserved cooking water to loosen the mixture if needed. Season to taste with salt and pepper. Divide between bowls and top with chopped basil before serving.